Goldfish are arguably the easiest fish to care for. Depending on species, they need little space, eat simple foods, and a small goldfish tank only requires regular water changes. If you’re just getting started in the world of aquariums, a goldfish tank is a perfect way to get used to the many duties that come with this rewarding hobby. Here are 7 facts that will help you get started on your own goldfish tanks. 1. Food. Goldfish food is relatively inexpensive and readily available at any pet shop and some grocery stores that sell pet food. The most common food comes in a flake form similar to tropical fish food. Goldfish also enjoy pellet foods since they resemble their natural diet. 2. Even a small tank or bowl should have some form of aquarium ornaments. Goldfish, like most other fish, need some place to hide for comfort. Aquarium rocks and other structures can easily provide hiding places. Don’t be fooled by the empty bowl of water with a small fish floating about. This is no life for a fish. 3. Live aquarium plants can also make a great addition to your tank, especially small tanks without filters. Plants return oxygen to the water and absorb nutrients from fish waste. This keeps the tank aerated and clean longer which keeps your fish happier between tank cleanings. 4. An air bubbler is another way of helping keep plenty of oxygen in the water. Any goldfish tank with more than one fish should have an air bubbler. Small tanks without filters should also have a bubbler. 5. 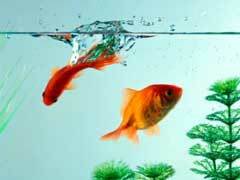 Goldfish are schooling fish, so they enjoy the company of other goldfish. Be sure to give your fish a friend. 6. If the average air temperature in your home is below 70 degrees, a tank thermometer should be placed in the goldfish tank to make sure the water stays warm enough. To help, try not to place the tank in a window during cold days. 7. The more you can do for your goldfish the happier they will be. An average life span for a well-kept goldfish is 10 years, and some can even live to 20 years!